The Smithsonian Folklife Festival returns to the National Mall with live performances, food, demos and kids' activities. This year, the Festival explores the culture of Colombia, the Peace Corps on its 50th anniversary, and Rhythm and Blues. See the complete schedule here. 11 a.m.-5 p.m.; free. The Uncle Sam Jam takes over the National Harbor with three stages, DJs, a lumberjack roll, fireworks and eats via Famous Dave's and food trucks. Scheduled performers include the Pat McGee Band, the Wailers and Blind Melon. 2-10 p.m.; 21+; $40-$75. Cool off at the Capitol Skyline Hotel (10 I St. S.W.) with its recurring Dubsplash pool party. Hosted by the owners of Eighteenth Street Lounge and Marvin, this party is known for its good vibes, great food and live DJs. 11 a.m.-9 p.m.; $15. The National FreedomFest at Yards Park (10 Water St. S.E.) will feature 40+ local bands and DJs, plenty of drinks, food vendors and crafts during this two-day party. 2-9 p.m. (July 3); 1-9 p.m. (July 4); $25 per day (two-day tix are $30); kids under 12 free. The Adult Swim Independence Day pool party at the Capitol Skyline Hotel (10 I St. S.W.) features a barbecue brunch, drink specials and live music by DJ Moh Ducis. Exclusive table packages are available by reservation (202-487-6874). Guests staying at The Capitol Skyline Hotel (10 and I Street SW) can enjoy discounted hotel rooms by using the promotion code ADULT. 11 a.m.-6 p.m.; free admission for ladies on the guest list until 1 p.m.; otherwise $20. Policy (1904 14th St. N.W.) is throwing a Burger Bash for the Fourth... well, Third. Burgers and veggie burgers (with toppings) will be sold for $5. You can also partake in a slider-eating contest; the winner receives a $100 Amex Gift Card. 5 p.m.-midnight; no cover. Chef Diana of Jackie's Restaurant (8081 Georgia Ave., Silver Spring, Md.) will be firing up the grill. Enjoy all-you-can-eat barbecue ribs, kabobs and more out on the patio. The day also features games, sprinklers and a bake-off contest. $20 per person (kids under 10 free). The DMV Brewers BBQ brings local brewers -- including 3 Stars Brewing Company, DC Brau, Flying Dog and more -- to Smith Commons (1245 H St. N.E.). Chow down on a special fixed-price barbecue menu and $5 pints all day. 4-10 p.m.; $20 entree/side/dessert. The First Sunday Arts Festival returns to historic downtown Annapolis at Calvert and West streets. Explore arts and crafts, food vendor, dance performances and more. Noon-5 p.m.; free admission. 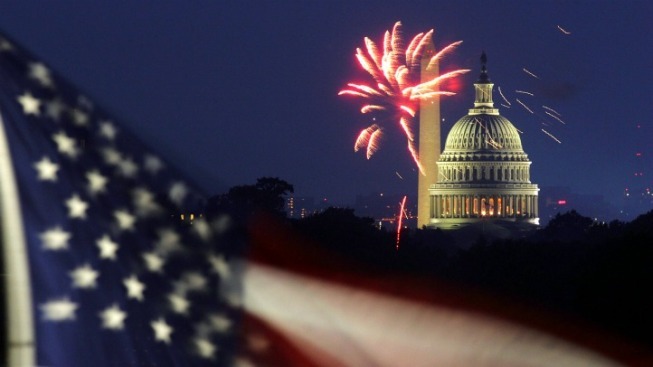 The District's capstone Independence Day event, A Capitol Fourth, brings an epic fireworks display to the National Mall, plus a star-studded concert lineup: host Jimmy Smits, Steve Martin (with his banjo! ), Jordin Sparks, Josh Grobin, Matthew Morrison and more. People will be snagging their prime spots on the Mall all day long.Admission begins 3 p.m.; concert on West Lawn of Capitol 8-9:30 p.m.
Take in panoramic views of the city during Boom With a View at the W Hotel (515 15th St. N.W.). The evening features hors d'oeuvres and a premium open bar from 6 to 9 p.m. New York-based DJ Sky Nellor will perform after the fireworks. $225; 6 p.m.-midnight. If you're ready to go early in the day, celebrate your patriotic side with floats, marchers, military bands, and more. Washington's biggest parade will take place on Constitution Avenue from 7th to 17th streets N.W. 11:45 a.m.; free. Get a different view of D.C. while cruising on the Odyssey -- mix a great view of the fireworks and the monuments with easy access to an open bar. You can also enjoy live entertainment and dancing. 6-11:30 p.m.; 21+; $189. The Capitol Hill Parade (8th and I streets S.E. ) brings classic cars, Mini Coopers, marching bands and dancers to the Fourth of July mix! Stay in the neighborhood afterward for a festival of entertainment, food and activities at Eastern Market Plaza. Parade 10 a.m.; free. Poste Modern Brasserie (555 8th St. N.W.) has an all-American picnic planned. Chef Robert Weland and a team of cooks from Poste will dish up American favorites such as glazed pork spareribs, potato salad, grilled corn on the cob, burgers and more. Reservations are required and can be made online here. 2 p.m.-8 p.m.; adults $27; kids $14. Spend the holiday in style at the Washington Hilton (1919 Connecticut Ave. N.W.). The Ultimate Fourth of July D.C. Package includes a classic American barbecue. Rain or shine, experience the fireworks from the hotel's lavish outdoor or indoor accommodations -- no overnight stay required. 5-11 p.m.; $30 per person at the door; free for kids under 12. It's happy hour somewhere, so enjoy your July Fourth afternoon by lounging at the pool, listening to Que Sera DJs and Outlaws DJs. Celebrate with the Summer Camp pool party series and win prizes at the Capitol Skyline Hotel (10 I St. S.W.) pool. Doors open at noon; $15 admission. Imagine spending your July Fourth watching the fireworks on D.C.'s largest rooftop bar. Mix in a five-and-a-half-hour open bar with pre- and post-parties and live music from four bands, and you've got the formula for the Red, White and BOOM party at Rooftop (1221 1st St. N.E.). 5-10:30 p.m.; $65 general admission; $85 VIP. General and Mrs. Washington will ring in America's birthday at Mount Vernon (3200 Mount Vernon Memorial Highway, Mount Vernon, Va.) for their annual An American Celebration. Enjoy a day of fireworks, military reenactments and a performance from the National Concert Band of America. The day will also include a reading of the Declaration of Independence and a naturalization ceremony for a hundred new American citizens. Go for the history, stay for the cake (and whiskey). 8 a.m-5 p.m.; event included in regular admission tickets; adults $15; kids ages 6-11 $7; kids under 5 free.